Learning how to read is kind of mysterious. There are certain rules and heuristics you can learn and follow, but there are so many exceptions that it almost seems like magic when the brain clicks and is actually able to read. The question many parents have is, "Is my child ready to read?" Learning requires a person to have a set of fundamental skills and then new skills are scaffolded from the existing ones. 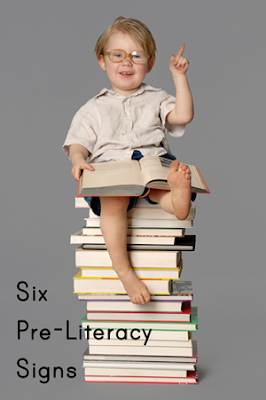 By knowing the signs of pre-literacy you can avoid frustration, by not starting formal instruction until your child is ready. 1. Phonological Awareness - Perhaps the most important skill of all, is for a pre-reader to be able to hear sounds. When a child has phonological awareness they understand what words sound the same, and what words sound different. They can figure out how many syllables a word has, and identify the discrete sounds in the word. If you say the sounds "k" "aa" "t", do they recognize that those are the sounds that make the word cat? Rhymes, tongue twisters, and songs are all the ways children learn to hear the sounds of words. 2. Vocabulary - Having a large vocabulary makes reading comprehension easier. If a large pool of words is already understood then divining context from a text is easier. Use a wide variety of vocabulary around your child. When they hear new words sometimes they will be able to figure out the meaning the word on their own, or they may ask you what a word means. Either way, they are practicing skills in comprehension. Read lots of books. It is often overlooked, but many picture books have robust vocabulary in them. Non-fiction books are great for learning new jargon specific to a topic. 3. Writing - Reading and writing go hand in hand. Physical movement makes stronger connections in the brain. By teaching reading through writing the child can more easily associates the connections between the alphabet, the sounds, and the meaning. Write letters. My kids love to write letters and draw pictures for their grandmas. Filling the envelope and putting the stamp on is part of the experience. Write lists. Grocery lists, to-do lists, daily schedule, etc. When I help my children write, sometimes I make dashed versions of letters for them to trace, and sometimes I dictate the letters to them. 4. Print Awareness - Stories and information are conveyed via words, and words are made up of letters. Words are read from left to right, and from top to bottom. You open a book from left to right and turn pages. These are all things that children usually figure out when they are around books. When your child starts asking you, "What does that say?" you know they have print awareness. Read lots of books. Occasionally point to the words while you are reading. 5. Alphabet Knowledge - This is the skill most everyone focuses on. To learn how to read a child should know the alphabet and what sounds each letter makes. Some people think you should teach the child the sounds first and simply call each letter by its sound instead of its name. Either way, eventually they will need to know the sounds of the letters. Alphabet books. Both my children learned the alphabet simply by reading them alphabet books. The children's section at the library is filled with alphabet books and thus we ended up read a lot of them. As they got older I would make up stories by going through the alphabet book and incorporating all the pictures into my story. 6. Talking About Reading - You know your child is ready to read, if they talk about wanting to be able to read, are asking you for help, or are trying to sound out words. Some children teach themselves to read because they are motivated by immediate access to information important to them. Children usually have a strong basis in all these skills by the time they are six or seven. With these skills mastered, figuring out how to read should be not too hard, but not too easy--a fun challenge your child can confidently tackle.